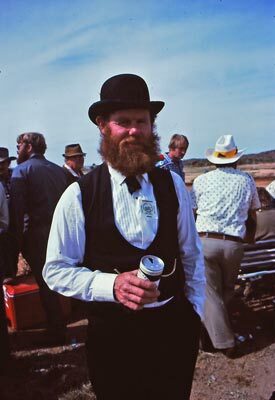 Back in August and September 1981 a group of us from the NSW National Parks and Wildlife Service decided to go to Tibooburra for the Centenary of the town. 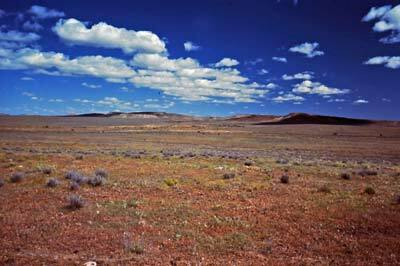 Tibooburra is the most isolated town in New South Wales and one of the most isolated towns in Australia. The first stop was to be Menindee and Kinchega National Park. From memory all but the Foxes travelled together. We left Sydney at 6 am and as we crossed passed Lithgow, we heard on the CB radio (the old 27 meg one) that there was snow falling ahead. Sure enough, soon there was light snow falling. It continued nearly all the way to Orange. I cannot recall where we stopped for morning tea and lunch, but we stopped at Dubbo for petrol. 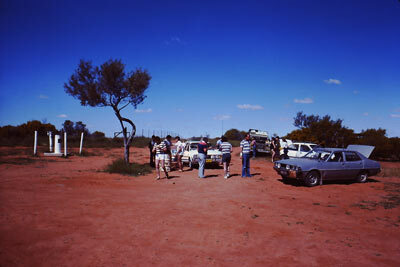 We arrived at Cobar at 4:30 pm. We had an office there and Dad had arranged with the District Manager, Bob Moffatt, for us to stay in his house (he and his family were away on holidays). We had a BBQ dinner, played a few games of cards and then went to bed. The second day saw us head off at 8 am. I refuelled before we left town. We had a good run along the Barrier Highway and took the eastern road along the Darling River to Menindee. We had arranged to meet Tom at Kinchega National Park. 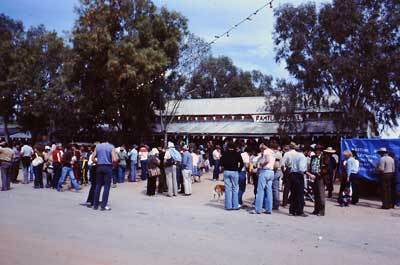 We arrived at Menindee at 12:30 pm and went to the Maidens Hotel for a counter lunch. Dad was disappointed to see that the bedroom that Burke and Wills stayed in on their historic and ill-fated trip into Central Australia had been turned into a pool room since his last visit. Here we also met up with Ray Lambert and his wife Alma. Ray also worked for NPWS and they were on their way to the South Australian vineyards and had stayed overnight at Broken Hill. It was Alma's birthday so we had a few beers to help her celebrate. We ended up staying a bit longer than we planned at the pub, not getting out to the park till 5 pm! Tom was about to send out a search party. This was my second time to Kinchega and it was still as interesting as ever. We explored the park and the historic shearing shed and shearing quarters. I again cannot recall where we camped, perhaps we stayed in the shearing quarters. The NPWS District Manager was John Eveleigh and he gave us an escorted tour of a section of Kinchega National Park. In the afternoon we toured the Darling River section of the park using NPWS brochures. 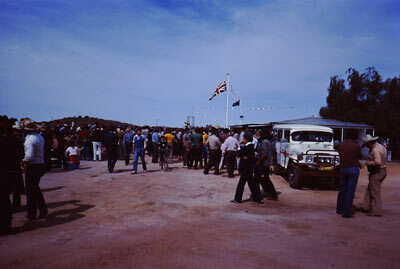 That night NPWS put on a slide and film show at the historic Kinchega Woolshed. There were about 80 people present. It is a pity that these sort of things seem to not be put on anymore. After the show, pancakes, tea and coffee were provided. This morning, we headed to Broken Hill. After getting some supplies, we visited the NPWS Regional Office (for all Western NSW). Here we had lunch at the Royal Exchange Hotel with the Regional Manager, Barrie Booth and the chief administration officer, Greg Tucker. We left Broken Hill about 3:30 pm and headed out to Mootwingee Historic Site. This is now split into two parts (with some extra additions) and called Mutawintji National Park and Mutawintji Historic Site. The historic site is now not open to the public. 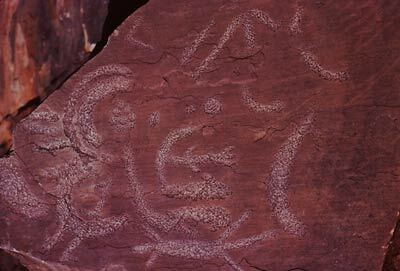 However, Mutawintji National Park is open to the public, but the most interesting bits are in the historic site. We travelled via the then very poor dirt road (it is a lot better in 2006 when I last visited - see my article on the 2006 visit - link via the 4WD page). Back then the park was managed by American born Don Beasley. We camped at the park headquarters, with some of us staying in the homestead and the others in a caravan. We had a BBQ dinner that night with great hospitality from Don and his wife Kerry. I remember getting up early and walking down to the creek that runs past the now camping area to take some photographs. It was an amazing sight, with so many birds in the early dawn. After breakfast we did a few walks here, into places that you cannot now visit unless on a guided tour (the Rock Holes). The guided tours now appear to almost never run based on my 2006 experience in school holidays). The whole place is a bit magical, and you can imagine that out in this hostile area, this place would have been quite a good place to live and find food and water. After lunch, at about 1:30 pm, we left Mootwingee. From here we drove up to Tibooburra via the most direct route (north to the White Cliffs road and then west to the Silver City Highway). The highway had absolutely no tar sections back then and it was a very average sort of dirt road. This was my third time to Tibooburra. Dad, my two brothers Stephen and Paul and I went there on a holiday in 1978 (there is an article on that trip linked from the 4WD page). 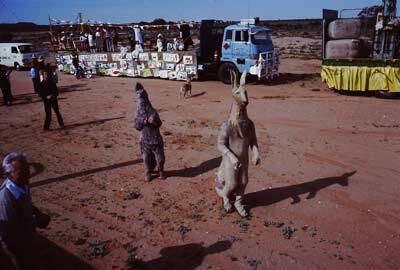 I also went to Tibooburra in January 1980 for a couple of weeks when I worked on a kangaroo research project. Really different out here in the middle of winter. We arrived at Tibooburra at 5:45 pm. 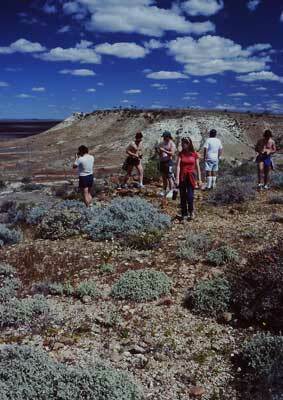 At Tibooburra we had arranged to stay in a new addition to the Sturt National Park. This was a homestead called Wittabrinna. The house had been basically uninhabited for a while, perhaps a year, and we ended up camping inside the house. 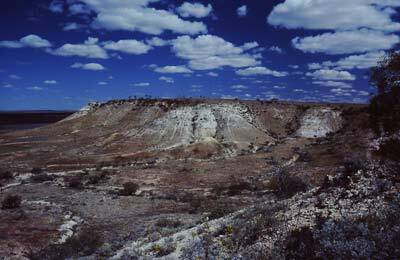 Rod Holmes was now the District Manager of the Tibooburra District of NPWS. 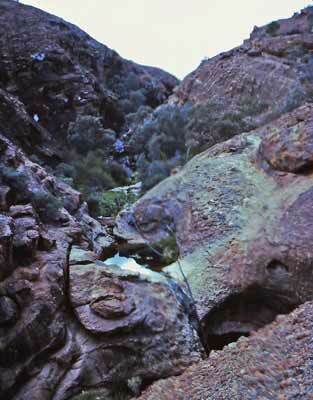 Also up here at the time was John Gerritsen who was the former Manager, he was now working in Broken Hill. One of the rangers was a new upstart called Russell Couch (he still worked till about 2014 for what is now called Department of Environment and Climate Change). Russell was actually staying in the house at the time. After dinner, we went back into town and to the Family Hotel. We ended up staying there till 1:15 am on the Thursday morning (well past the official closing time of hotels back then of either 10 or 11 pm!). We bought bottles of Centenary Port (which I still have unopened) as well as some special Centenary cans of West End beer (again, I still have these unopened). A big start to a big weekend. Over the next week we went to the many events arranged for the 100th birthday of the town. We were up early, despite the very late night, as John Gerritsen was taking us on an escorted tour out to Camerons Corner (as it was then called - now it is just known as Cameron Corner). Using CB radios, we had a very informative tour. These used to be run free out there by NPWS during the cooler school holidays. Lake Pinaroo (Fort Grey Lake) was dry, whereas back in January 1980 when I was last there it had enough water in it to swim. There were lots of wildflowers, including the beautiful Sturts Desert Pea. We even saw a bustard alongside the road. 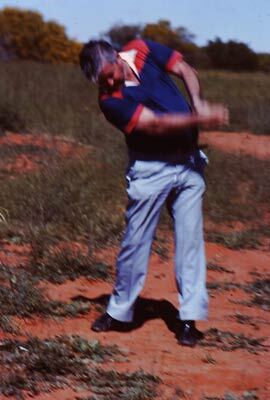 At Camerons Corner, Dad again hit a golf ball using an 8 iron from NSW over Queensland into South Australia. He also did this on our trip back in September 1978. In 2010 my wife Kelly and I found two golf balls here. I took one home and left the other. Unfortunately, they were not the ones Dad hit as my brother Paul confirmed to me that they were the newer and larger American golf ball that superseded the then smaller Australian ball after 1981. Afterwards, John G had to take our photos at Camerons Corner using 9 cameras! Of course there was no shop or hotel or telephone at Camerons Corner then, just the intersection of the three States and the corner post. I think we then went back to Wittabrinna Homestead and had dinner there. In the morning we went into town and explored (that did not take much time) and visited the Art Show. After lunch we went on the Olive Downs Drive self drive tour. 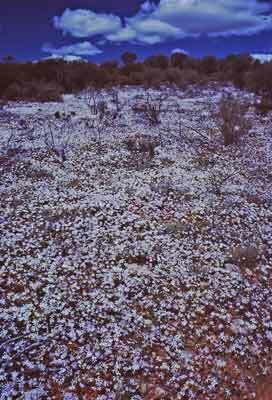 This is north of Tibooburra. We travelled via the various tanks (man-made dams fed by windmills). These are quite interesting, even now, with lots of birdlife attracted to the water. At the Jump Ups, we did the Jump Up walk during which PG Moore provide a very amusing reading of the 16 interpretative signs. 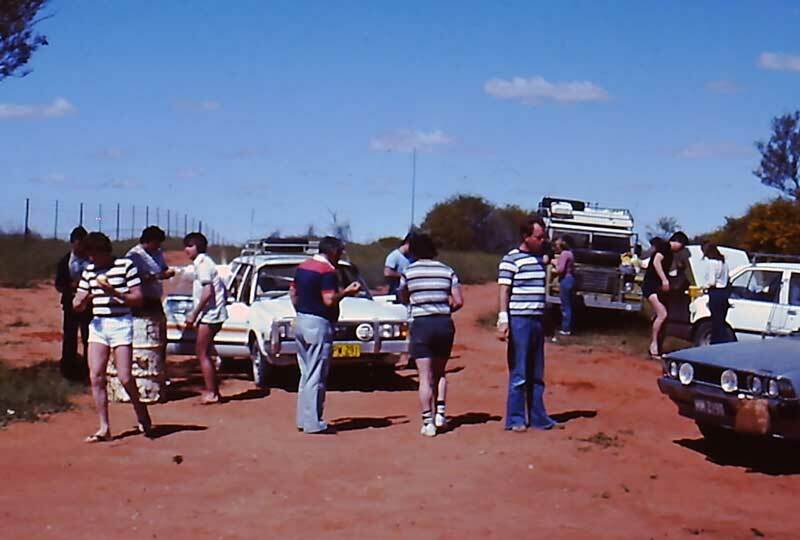 We then travelled (I think) via Olice Downs Homestead to the Silver City Highway near the Queensland border and then headed south back towards Tibooburra. Back at Wittabrina, we had dinner and cleaned up for a big night out. Once we were ready, we went into town for the big show. This was held in a huge tent just south of the main section of town (I think). There were over 900 people at the show (the town's population back then was about 120). As well as some singing, there were two plays. One was Cinderella (Starring Russell Couch and the new Senior Ranger, Rod Holmes). Unfortunately, I do not seem to have any photos of this, but if I can find some, I will add to the page. 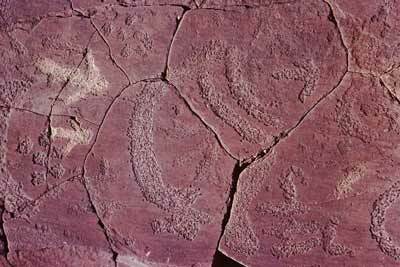 The other was "The Perilous Progress of Percival Poncefort, the Penniless Prospector from Packsaddle" a play which, from memory, was supposed to be about the early days of Tibooburra. It was written and performed by locals. Russell again starred, this time as Percival Poncefort. His love interest, Purity O'Farrell, was played by NPWS Clerical Assistant, Jan Nicholls and the villain Shifty Fogarty the Foul Mouthed Fencer from Fortville was played by Park Worker Dave Perriman. It was produced by Senior Ranger Rod Holmes. It was a night of fun. 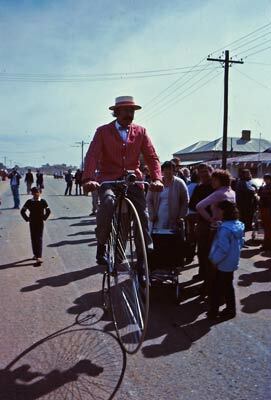 The town was founded on 4 September 1881 (as a result of a gold rush) but today was the big event. In the morning there was a huge parade through the town. We even ended up on the NPWS float (on the back of a large NPWS truck driven by Ranger George Townsend) as part of the parade. 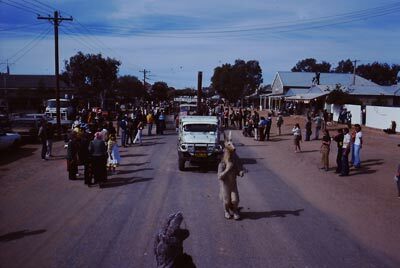 Most of us played tourists, I played a Ranger, and Greg Brown and Sheelagh Russel-Jones dressed up in kangaroo suits and followed the float. Greg even got harassed by a local dog who obviously did not like kangaroos. 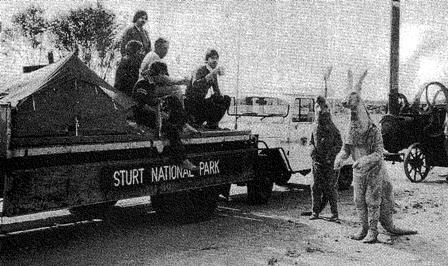 As well as NPWS, the Department of Main Roads, the town's other main employer (now called RTA) had their graders and trucks in the parade. There were even T model Fords, an Aboriginal community float and John Gerritsen riding a camel. A plaque was unveiled in town by 76 year old Mrs Ella Bowman. After this the beard judging was held. All the NPWS staff had grown beards for this event. The odds-on favourite, NPWS's Rod Holmes bolted in as the winner. In the afternoon was the Gymkhana. This was a horse race meeting. This was a great event, with PG and Dave Rothwell backing a 25 to one winner. There were a number of races on the dirt racecourse. The place was packed and we had a fantastic time. There were even bookmakers. At some time, Dr Ashok Rathore, NPWS's pest animal poison expert, arrived in Tibooburra to cook dinner (ironic given his position) for a wedding that was being held to coincide with the Centenary. The local couple had lived together for 17 years so I suppose they thought this was the right time. On Sunday we drove down to Milparinka and went out to Depot Glen where Charles Sturt was stranded on his exploration trip. 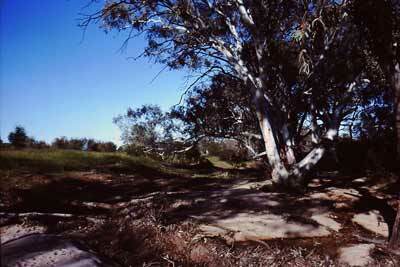 We also went out to the Mount Wood area of Sturt National Park where we did the Golden Gully Walk. This is where John Gerritsen had built a fantastic gold mining display. It is still there but looking a little tired in 2003. PG, Sheelagh, Michael McBride and Russell went to the sports afternoon that day (I think it had lots of things like three legged races etc). They certainly enjoyed it, all returning late that night very worse for wear. I think that the rest of us went to a BBQ that night out at Mount Wood Homestead where George and Kathy Townsend lived (but it may have been last night). Also there were Graham (Blinky) Blinksell (another NPWS Chief Ranger from Kosciusko National Park and former Manager of Mootawingee HS) and Barrie and Nancy Booth from Broken Hill (Barrie was the Regional Manager, Western Region). Over the weekend, Ian Leslie from Sixty Minutes TV show on Channel Nine was there and they produced a story on the events. However, it was a bit of a beat up and was not a true reflection of what went on over the week. Today was the day we were leaving Tibooburra. Most of us were going in different directions. Garry Ellis and his crew were heading home as were we. Tom went via Nocoleche Nature Reserve (south of Wanaaring) and Bourke. Greg's car headed to South Australia and the Barossa Valley. We headed home via Wanaaring and Bourke. Unlike the time I drove there in 1978, we did not need to detour off the main Wanaaring to Milparinka Road get avoid the flood on the Bulloo River Overflow (this was from the 1974 rains). We actually drove non-stop to Sydney as when we got near Wellington and Bathurst, we could not get any accommodation as there was some sort of travelling salesmen's convention on and it was all taken. In addition, tomorrow was my parent's 25th Wedding Anniversary and Dad wanted to be home. 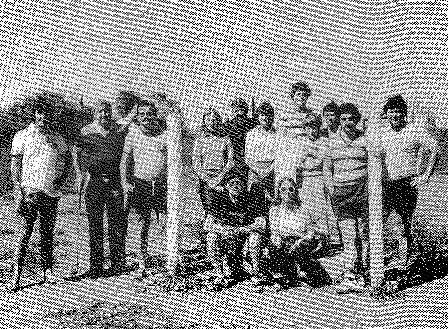 We arrived at Little Bay at 12:20 am on Tuesday 8 September 1981. A very interesting trip to a part of NSW that at this time was visited by very few people. The friendship and dedication of the NPWS staff out west was so amazing. I often wonder about what has happened to our society where we have lost this sort of friendship between workmates. It was also interesting doing it in a two wheel drive with little clearance. We had no problems at all. 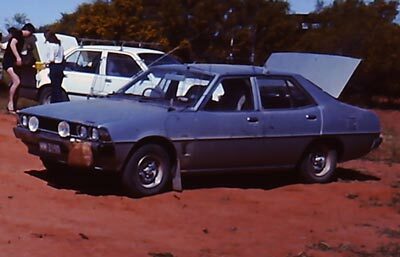 You could do most of the outback trips in Australia in a two wheel drive (eg the Birdsville Track, Oodnadatta Track) so long as you are well prepared and some even harder ones if you had four wheel drive with you.